Baku is increasingly becoming a famous tourist destination. Recent international sport events such as Formula 1 Azerbaijan Grand Prix, or 2019 UEFA Europa League Final in Baku, or UEFA EURO 2020 will bring more popularity with more tourists visiting the city. Therefore, here we list top mainstream things to do and see in downtown Baku. The most historic quarter of modern cosmopolitan Baku is called Icherisheher (aka Inner City or Old Town). It used to have dozen of quarters. Each quarter had its population with different various socio-economic and political background as well as its own mosque and hammams, the bath-houses. Hammams occupied an important place to organize social interactions: men would discuss politics and solve problems of any level whether personal or society; women would use hammams as a platform to exchange gossips, trade rumours or choose their son’s future wives. Although it is not as common as it used to be, however they are still retain their oriental charm. When they met at the Governor’s Garden… “My hand glided over her hair. She lifted her head. The last ray of the setting sun was in her eyes. I bent towards her. Her lips opened tenderly and submissively. I kissed her for a very long time, and very improperly. She breathed heavily. “Then she tore herself away. We were silent and stared into the twilight. After awhile, we got up, a little shamefacedly. Hand in hand, we left the gardens. The Governors Garden is now officially called Philharmonic Garden, however it still looks pretty much the same as Ali described it. You, too, can have your Ali and Nino moment there. Recent Euromonitor survey portrayed Azerbaijan as second most tea-drinking society with absolute majority of population, 99.1%. So this is a tea-driking society. In this society, tea (çay) is a solution to everything. Literally. One of the best ways to experience tea culture is to visit chaykhanas (tea houses). However, there is a truth that most chaykhanas are stereotypical places where usually macho guys gather around to discuss “manly” issues over ridiculous number of cups of tea. Nonetheless, chaykhanas one of the mostly visited family place in Baku. In chaykhana they would usually order two teapots: thyme tea and black tea. Of course, do not forget about jam as they are inseparable. There are many types of jams you can choose to arrange a set of tea-jam duo: such as tea with walnut jam. Kebab (aka barbecue or shashlyk) is various kinds of slow and usually outdoor cooked meat dish using skewers and fire-pan. In Azerbaijan, kebab is food that must be served for your most respected guests or during most feasts, celebrations and holidays. Even an Azerbaijani proverb goes saying that “Kabab qanlı, igid canlı” meaning that kebab must be undone, but a hero vigorous. Most popular kinds of kebabs are tike kebab, lulah kebab, basdirma kebab. 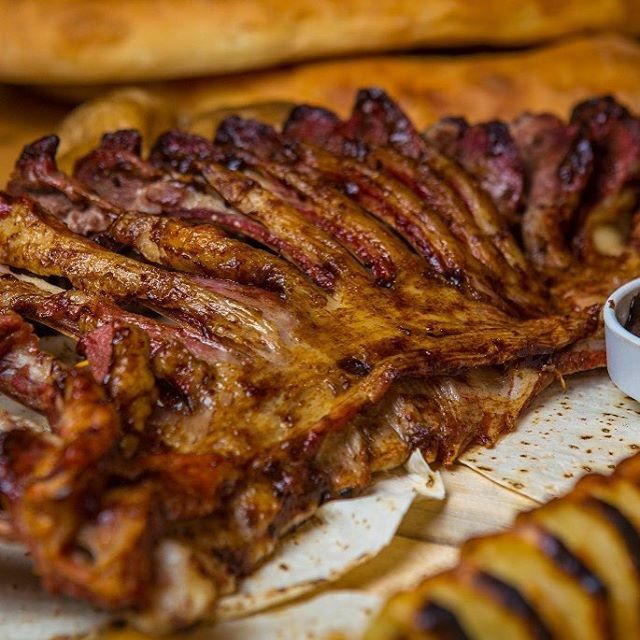 Your most ultimate kebab feast would be ordering sebet kebab, a complete rib cage of lamb for four people. You can treat yourselves with sebet kebab in Qedim Qebele (open: 10am to 12am) for 50-70 AZN. Icharisheher, translates as inner city, is the most historic part of the city and is mostly known as Old Town. It houses four UNESCO World heritage sites. Icharisheher was used to be a Muslim quarter of Baku until mid 20th century and the streets, settlements, house and public places were designed in accordance with acceptable behaviour of social interactions in an oriental city. Icharisheher, now, with three thousand population and still retains some of its oriental qualities in a city of 2.5 million population as the population of Icharisheher would call themselves as native Bakuvians. Strolling through narrow streets of Icharisheher will allude you to idea of you being locked in a labyrinth of historic attractions of XI to XV centuries. Join our Baku Original Walking Free Tour to explore best of the Icharisheher. Maiden Tower (Qiz Qalasi) is the most iconic landmark of Baku. However it is shrouded in complete mystery. This is to say that we do not know when it has been constructed, who architect is, what use of purpose it served or why it is called Maiden Tower. It is also a sophisticated construction of 8-floor and 29.5 metre tall cylinder-shaped structure built on huge rock sliding towards the Caspian Sea, 5 metre-thick wall with water well on the third floor, ceramic tubes from ground floor to top, a sewage system presumably, and all the windows facing towards the south-east, wide and tall buttress many other qualities contributes to secrecy to the most obvious and visible monument in the Old Town. Locates in Icherisheher. Open everyday 9am-6pm. Entry fee 15 AZN. Shirvanshah Ibrahim, the first, and his son Shirvanshah Khalilullah, the first moved capital to Baku after devastating earthquake levelling Shamakhi, main capital city, in XV century. They built a Palace Complex of burial-vaults, courtroom (divanhane), shah’s mosque, Seyid Yahya Bakuvi’s Mausoleum and bath-house that survived up to day. Although Shirvanshahs were modest and minimalistic in their approach to construction, the Palace Complex represents one of the best examples of Abhseron-Shirvan Architecture School. Locates in Icherisheher. Open everyday 10am-6pm. Entry fee 10 AZN. Zarifa Salahova, sister of Tahir Salahov, is a formidable woman. As one of residences of the Old Town, she privately owns one of the most unique and strangest museums of the World that took over 30 years of her life to build it. Even the museum itself is a world of its kind regardless of its scale. That world is dedicated to teeny-tiny books known as miniature books. Although Guinness World Records certified 2.937 books as the largest collection of miniature books, she actually owns 8,500 of miniature books. Visit to see the tiniest book of the world exhibited behind the glasses of the second shelf in a blue case within white-background circular container: it 0.75 mm microscopic book publish in Tokyo, Japan in 2012. The 22-page book is titled as Flowers of Four Seasons. Locates in Qasr street 67 . Open 11am-5pm; Tue-Sun. Closed Mon-Thu. No entry fee. Funicular is a popular sightseeing attraction built in 1960s. It is a transport system connecting the lowest part of Baku, the Seaside promenade, with the highest point, the Highland Park. You see emerging beautiful scenic Baku and the bay, meanwhile the ascending funicular takes you up to the park. Night time in the park you observe and enjoy the view we’d like you to see, however, you can see city silhouette with all ugly and beautiful, dark and bright, dirty and clear sides of the city. Locates in Shovkat Alakbarova street. Open 10am-10pm; Tue-Sun. Closed Mon; Lunch break 1pm-2-m. Entry fee 1 AZN. Completed in 2013 the Heydar Aliyev Center became an iconic landmark of modern Baku to shape and influence ideas and movements in an era of redeveloping Baku. Built by Zaha Hadid, British-Iraqi architect, it represents an architecture of fluid and infinite patterns, form, shape, grid, column, surface and structure by applying futuristic understanding of local culture and historic Islamic architecture. It loses its essence and purpose with more words you put down on paper. Better you give a visit and eyewitness it yourselves. Locates in Heydar Aliyev Ave 1. Open 11am-5pm; Tue-Sun. Closed Mon. Entry fee 15 AZN. A 50-year old Baku Metro is labelled as national wealth of Azerbaijani people. Besides it is use as one of cheapest and fastest transport means, every metro station carries heavy burden of symbolism: Nizami metro station is dedicated to 12th poet Nizami Ganjavi, the Greatest of all Greatests; 20 Yanvar (January) is dedicated to a day when Soviet army peaceful protestors to crack down independence movement in Baku; or Neftçilər (Oilmen) is honouring oil workers for bravery and hard work. Therefore every metro station would be designed with a particular theme and carriage arrival announcement would be accompanied with a 10-second musical tone to dramatize presentation of a station. Locates in 28 May, Central Station. Open 6am-midnight. Entry free 0.30 AZN.